March is done, and April is upon us. Happy Easter weekend to you who celebrate! 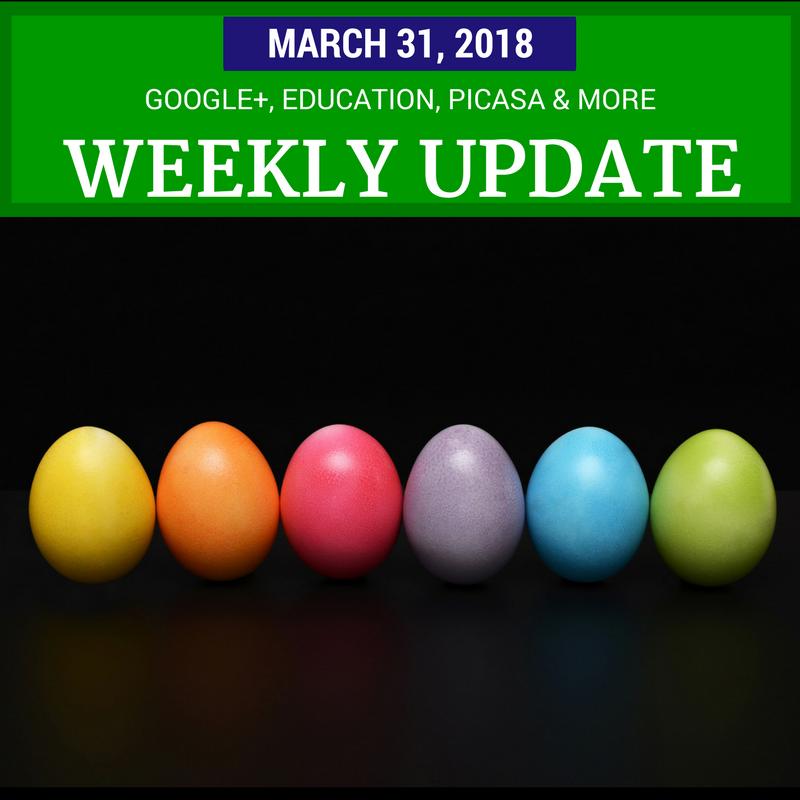 This week we said hello to new features in Google+ and YouTube, and goodbye to Picasa, plus much more. Google+ introduced a new features that lets you subscribe to highlights from Communities and Collections. Instead of getting notified of all new posts, you will get a daily digest of the “top” new content. Google+ is also continuing to work towards making the same features available across all platforms. Both Android and iOS Google+ apps now let Community moderators remove, report, ban and optionally remove recent content with just a few clicks. YouTube will be launching an ads policy compliance confirmation checkbox for monetizing videos - no more accidentally (or “accidentally”) monetizing non-advertiser friendly content. This puts the burden on Creators to make sure that their videos follow the Partner Program policies, rather than counting on YouTube to not display ads on videos that shouldn’t have them. The Picasa desktop app can no longer go online, upload or download images. Google officially stopped supporting Picasa two years ago, so this change shouldn’t come as a surprise to anyone. At least for the time being you can use Picasa as an offline photo organizer and editor. If this affects you, check out the guide from the experts over in the Picasa help forum for switching to Google Photos. Google and Apple have both introduced duling tablets aimed at students and the education market. Google announced Chromebook tablets, with an emphasis on security, easy controls for administrators, durability and a wide range of apps. Meanwhile Apple hosted an education event where they announced a new iPad with Pencil support, and a new suite of apps aimed at students and teachers. Apple emphasizes the creative possibilities using their hardware. It looks like the price will be about the same, so the question is which hardware and software ecosystem schools choose to adopt. YouTube had one of the biggest gaming live stream events of all time. elrubiusOMG, a Spanish gamer, organized a global Fortnite tournament. At one point his livestream had 1.1 million concurrent viewers. And across the 99 channels that participated, there were more than 42 million live views. That's not the biggest live stream audience - the Space X rocket launches can have more than 2 million viewers - but it tops other gaming live streams. Plus there are tips and updates for business owners, webmasters, live streamers, AdSense publishers and much more.